See how saving energy saves you money and leaves the world a better place. By investing in NetZero technology for your home, you can push the threshold of sustainable living, helping create an environmentally responsible community today! Your New or Existing homes can be designed to be NetZero. What that means is your home can produce as much energy as it consumes on an annual basis. To achieve your NetZero home, first, energy demands are reduced by using proper insulation, air tightness, and high-performing windows and doors. Secondly, energy efficient equipment and appliances are installed. Finally, clean energy is generated on site by taking advantage of renewable resources such as solar, geothermal, or wind. What are the Benefits of Living NetZero? By making the transition to a NetZero home, you will gain much more than just reduced energy demands, you’ll gain peace of mind and so much more. Energy modelling allows us to measure the energy performance of your existing home by assessing key energy saving opportunities such as insulation, windows, doors, heating and cooling, ventilation, lighting, and appliances. Reducing the amount of heat transferred between the inside of your home and the outside environment results in a substantial decrease to your home’s energy requirements. Elements that lower heat transfer include exterior insulation, air tightness, and triple-glazed windows. Together, these elements result in more than just energy savings. Additional benefits include a highly stable and uniform temperature throughout the house, even in the most extreme summer or winter weather conditions. Imagine putting one dollar into your bank account and getting four in return. That’s kind of how a heat pump works – giving more energy output (heating or cooling) than it takes in. So, forget that furnace! With state-of-the-art mechanical equipment and energy-efficient lighting and appliances, your entire home can be powered by clean electricity. As a bonus, the indoor air is filtered to be free of dust and allergens. By including a way to generate renewable energy on site, such as installing solar panels, geothermal, or a wind turbine, your home can produce all the energy it requires throughout the year. By remaining connected to the electricity grid, you get the best of both worlds. You maintain reliable electricity service at times when your demand exceeds your production, while earning credits when there is excess energy produced. These credits reduce the monthly energy bill to a small transmission and administration fee depending on your energy provider(s). Or include on-site storage for peace of mind and keep the lights on during that next unexpected power outage. Final energy modelling measures the impact of your investment on the energy performance of your new or renovated home. Now that you’ve updated your energy reducing variables such as insulation, windows, doors, heating and cooling, ventilation, lighting, and appliances, this final audit demonstrates your immediate savings and health benefits for you and your family. One of the most common concerns about green construction is that it will cost more money. This is a misconception. While some costs may be needed to upgrade key energy saving materials, this investment produces savings that outweigh the initial costs over the long-term. As the price of energy goes up, your energy and utility bills will lower or NetZero. 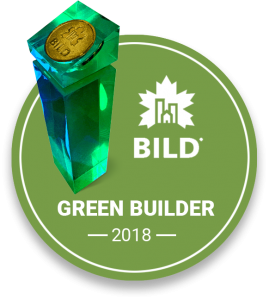 Green building should ideally be viewed as a sustainable investment in your financial, physical and environmental well-being, as well as that of the environment itself. We can help finance your NetZero Renovations through our preferred lending partners who mutually value creating your NetZero home. Learn More about NetZero and how you too can help leave the world a better place. Through your home you too can push the threshold of sustainable living, helping create an environmentally responsible community today! This Site does not automatically gather any personal information from you unless you provide it to Dunsire voluntarily through contacting us via e-mail, or through your completing and submitting an online form. Personal information (such as name, e-mail address, phone number) obtained from users of this Site is collected, managed, used and disclosed by Dunsire pursuant to The Local Authority Freedom of Information and Protection of Privacy Act (Ontario). This means that, at the point of collection, you will be informed that your personal information is being collected, the purpose for which it is being collected, and that you have a right of access to the information.